Police and sheriffs' officials and district attorneys have bucked state voters and lawmakers and have aligned themselves with the president and Attorney General Jeff Sessions. In a speech before a law enforcement lobbying group in Sacramento earlier this month, U.S. Attorney General Jeff Sessions attacked California political leaders, calling them "lawless open borders radicals," and announced a lawsuit to overturn the state's sanctuary laws. In response, dozens of state lawmakers held a protest and pledged to step up their resistance to the Trump administration, while Gov. Jerry Brown derided Sessions' visit and called his lawsuit a "political stunt." Sessions' trip marked a deepening rift between California and the federal government. It also further exposed a different divide: one inside the state that is widening and having far more influence on immigration and criminal justice policy than anything the Trump administration is doing. In recent years, California's police and sheriffs' departments and district attorneys have played their own role of resistance — against a wave of progressive criminal justice and immigration reforms that state voters and political leaders have embraced. Through their rank-and-file unions and statewide lobbying groups, cops and prosecutors have fought nearly every progressive criminal justice proposal and the same California pro-immigration policies that the Trump administration hopes to topple. And they've strongly backed right-wing firebrands like Sessions. "Law enforcement tends to unify against criminal justice reform, both in the legislature and at the ballot box," said Ana Zamora, criminal justice policy director of the ACLU of Northern California. "If you look at what California voters and lawmakers passed in terms of Proposition 47 and SB 54, the mainstream has moved away from dumb-on-crime policies," said Zachary Norris, executive director of the Ella Baker Center, referring to the criminal justice reform ballot measure approved by voters in 2014 and the state's new sanctuary law, respectively. "But these law enforcement associations are out of step." They might be out of step with the state's liberal majority, but police and prosecutors continue to wield significant political power. And their views are more aligned with the conservative law-and-order positions espoused by the Trump administration than with California residents and elected leadership. 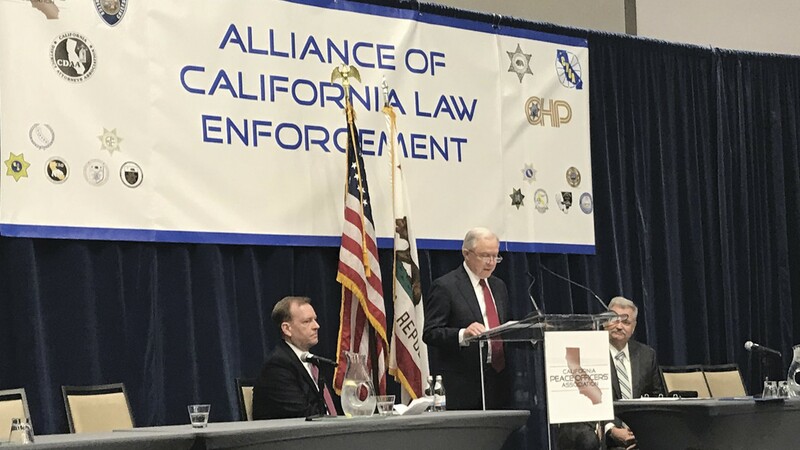 Sessions, for example, was hosted in Sacramento by the California Peace Officers Association, one of the state's more powerful police lobbying groups, despite pleas from state lawmakers not to give him a bully pulpit. Assemblymember Eloise Reyes, D-San Bernardino, for example, told CPOA President Marc Coopwood, who is also a Beverly Hills' assistant police chief, in a letter, that by hosting Sessions, the group provided him with a "platform to espouse his anti-immigrant and harmful rhetoric." State Assembly Speaker Anthony Rendon, D-Los Angeles, tweeted a copy of Reyes' letter, adding, "@CalPeaceOfficer should revoke its invitation to have Mr. Sessions speak in Sacramento tomorrow." Last week, the CPOA's immediate past president and current board member, Sacramento County Sheriff Scott Jones, attended a White House immigration roundtable where he told Trump that California's sanctuary policies are a "spectacular failure" and described how he's embedded ICE agents in his jail. California law enforcement's backing of Sessions preceded his ascent to attorney general. Last year, when he was first nominated by Trump, the Peace Officers Research Association of California (PORAC), which has 69,000 law enforcement members, sent a letter of support to the U.S. Senate urging Session's confirmation. But it's in Sacramento, not Washington D.C., where the state's law enforcement groups are most influential. According to Angela Chan, a civil rights attorney with the Asian Law Caucus, law enforcement groups routinely block or delay reforms through the sheer number of lobbyists they employ. For example, in 2011, Chan was at an Assembly committee hearing to support AB 1081, an early version of the Trust Act, which was intended to stop sheriffs' offices from participating in the federal Secure Communities Program. Under Secure Communities, the fingerprints of everyone booked into local jails were automatically sent to immigration agents. If the prints identified an undocumented immigrant, ICE could then send a "detainer request" to the sheriff asking the jail to hold the person so deportation agents could take him or her into custody. All of California's sheriffs participated in the program. The Alameda County Sheriff's Office was an early adopter, holding upwards of 155 immigrants daily on ICE detainers, according to a 2010 San Francisco Chronicle report. But many of those deported under Secure Communities hadn't been convicted of a crime. Others were only facing nonviolent, misdemeanor charges. Multiple federal judges subsequently ruled that detainers are unconstitutional because they extend the jailing of individuals for whom local sheriffs and police have no legal cause to hold them. Even so, passing the Trust Act took years due to resistance from the California State Sheriffs' Association. Alameda County Sheriff Gregory Ahern was a prominent opponent of early versions of the bill, as were the sheriffs of Los Angeles and Orange counties. Also on the sheriffs' side was the anti-immigration group Californians for Population Stabilization — which has blamed immigrants for violent crime and even the state's drought.